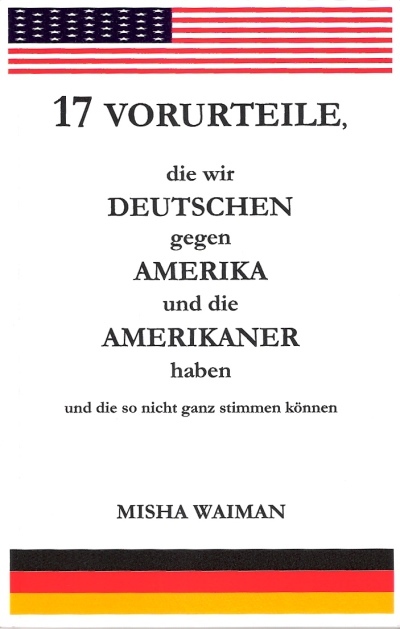 In this caustically funny philosophical polemic, Misha Waiman uncovers the paradoxes and absurdities underlying Germans’ love-hate relationship with the US and its culture. Why are Germans both fascinated and repulsed by the US and its culture? What do Germans think and say about Americans and why? These and other germane questions bearing on the pervasive cultural and political tensions between contemporary Europe and the US are addressed and answered in this witty, yet serious, polemical, yet conciliatory, personal, yet globally relevant exploration of reigning anti-American prejudices among Germans and Europeans at large. Written from the author’s perspective as a German-Russian-Jewish-American, this book cannot fail to provoke, enlighten, and undermine many a cultural assumption we live by, forcing us to rethink the ways in which we think and talk about those who seem different from us. Waiman’s unflinching confrontation of the culture of prejudice has been hailed as “unprejudiced and profound” by Germany’s premier satirist, Raphael Seligmann, and depicted as “excellent, funny, incisive … a bull’s eye” by Andrea Wörle of Deutscher Taschenbuch Verlag. "... großartig, witzig, polemisch, ironisch, scharfsinnig ... [ein] Treffer ..."
"... ich zweifle ... nicht daran, dass es genügend Menschen gibt, die gut daran täten, dieses Buch zu lesen ... "
"... frech, unvoreingenommen, tiefgründig ... "
"Jeder von uns kennt diese Vorurteile und hat seinen Teil von ihnen sicher verinnerlicht. Umso interessanter liest sich ihre Analyse ..."
"Wer sich ... über die bisherige Entwicklungs- und Wirkungsgeschichte deutscher Vorurteile gegenüber Amerika ein Bild machen will, dem sei Waimans Streitschrift wärmstens empfohlen. 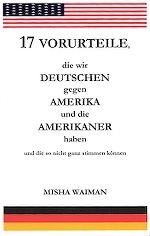 Klar und witzig geschrieben, selbstkritisch und weltoffen konzipiert ... stellt diese konzise Polemik ein kongeniales Reflexionsmedium dar ..."
Misha Waiman (A pseudonym of Michael Eskin) was educated in Israel, Germany, France, Minnesota, and New Jersey, and is the cofounder and Vice President of Upper West Side Philosophers, Inc. – Studio & Publishing, as well as the Vice President of SCALG, the Society for Contemporary American Literature in German. A former Fellow of Sidney Sussex College, Cambridge, he has also taught at the University of Cambridge and at Columbia University. His many publications on cultural, philosophical, and literary subjects include: Nabokovs Version von Puskins “Evgenij Onegin”: Zwischen Version und Fiktion – eine übersetzungs- und fiktionstheoretische Untersuchung (1994); Ethics and Dialogue in the Works of Levinas, Bakhtin, Mandel’shtam, and Celan (2000); On Literature and Ethics: A Special Edition of Poetics Today (2004); Poetic Affairs: Celan, Grünbein, Brodsky (2008); 17 Vorurteile, die wir Deutschen gegen Amerika und die Amerikaner haben und die so nicht ganz stimmen können (under the pseudonym ‘Misha Waiman’; 2008); Philosophical Fragments of a Contemporary Life (under the pseudonym ‘Julien David’; 2008); The DNA of Prejudice: On the One and the Many (2010); The Bars of Atlantis: Selected Essays by Durs Grünbein (2010; as editor). He has been a frequent guest on radio programs and lectures regularly on cultural, philosophical, and literary subjects across the US and Europe – most recently, as a guest of the United States Department of State and the United States Consulate General Germany, The Federation of German-American Clubs, and Limmud, an international organization fostering cross-cultural Jewish education. Interview in Das Fenster (May 2008) - Jetzt lesen! / Read Now!